Until 2005, Israel regularly demolished homes of purported terrorists as a “deterrent” against future attacks. It was a controversial policy that many, including the United Nations and Amnesty International, argued served as a form of collective punishment in violation of the Geneva Conventions. In 2005, the practice was deemed by a military committee to be “questionable” as a counter-terrorism tool and that it “walked the line” regarding its legality. The practice was primarily abandoned at that time. But in 2014, following the abduction and murder of three yeshiva students, the policy was resumed. Although Israel demolishes far less homes per year then they did prior to 2005, nearly two dozen homes or apartments have been destroyed in the last two years. The most recent demolition took place on Sunday night/Monday morning. The demolished house was the home of the family whose son stabbed and killed 13 year old Hallel Ariel on June 30th as she slept in her bed in the nearby Jewish settlement of Kiryat Arba. The perpetrator, 17 year old Muhammad Nasser Tarayrah, was shot dead by the settlement’s security team immediately following Ariel’s murder. In the days that followed, Israeli troops arrested Tarayrah’s 22 year old sister for sharing a video stating that “My brother is now a martyr. May God judge the Jews, and may my brother be content with his portion in paradise.” The charge against her was “incitement and encouragement of attackers to engage in terrorist attacks.” Seven others in the area were also arrested during overnight sweeps. Last week, Tarayrah’s home was approved for demolition by the Supreme Court. The family appealed and the order was upheld, although it was altered to clarify that the entire three-story structure could not be demolished by the state, only the second floor where Tarayrah’s family lived. Last night that order was enacted by a team that included at least one IDF filmmaker. 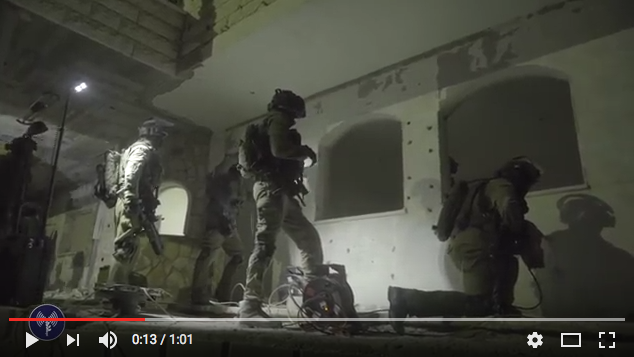 The IDF produced a short film showing the soldiers setting the charge and blowing up the second floor of the building. 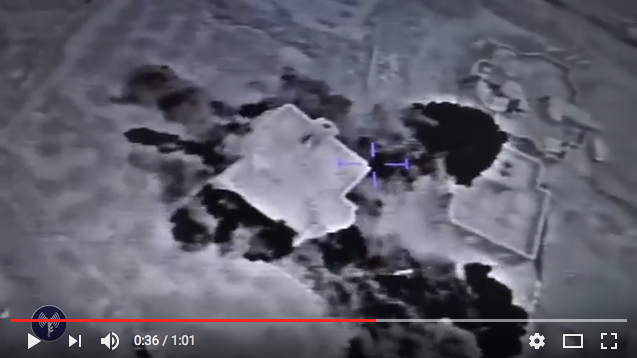 It features what appears to be drone or satellite footage, as well as shots taken both on the ground and in the home. The IDF is active on Facebook, Twitter, Instagram, YouTube, Snapchat and through their blog, regularly sharing videos and media through their well-maintained social media channels. They share information about terror attacks, misappropriation of funds from Hamas (some examples from just this week here and here), and show their troops training and patrolling Israel’s borders. 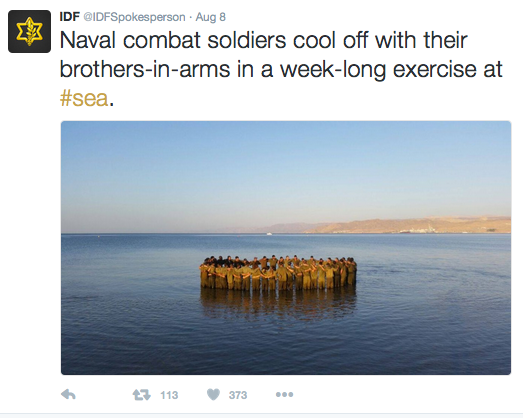 They also show a more human side to the army: soldiers giving Krav Maga lessons, troops dressed up in silly costumes for Purim, soldiers wishing the world Shabbat Shalom, etc.. Here’s an example tweet: a group of naval combat soldiers cooling off after a week-long exercise. 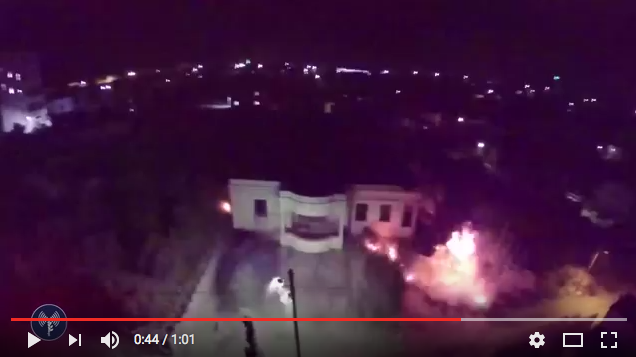 Following the demolition of the Tarayrah home, the IDF took the footage and and edited it together into a minute long video. They then distributed that video out to the press. But they chose not to share it through any of their own, well-established and heavily-used channels. 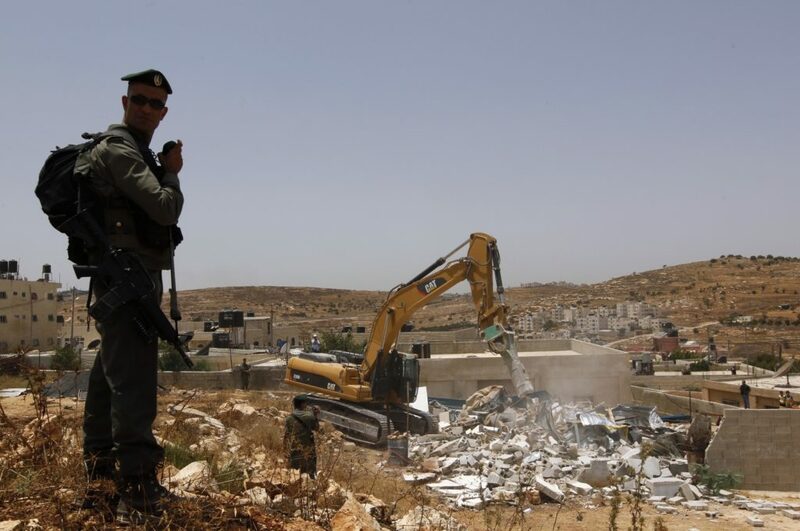 They did the same thing in April, after demolishing another home of a convicted terrorist. They made the clip, provided it to the press, but opted not to distribute it themselves. I spoke with Judah Ari Gross, The Times of Israel’s military correspondent, about why. He explained that the IDF shares relevant information with the press via email and text. He gets their messages in both Hebrew and in English. It is through these messages that the Times of Israel received the two home demolition videos in question. The messages sent in Hebrew and English are usually similar, but there are sometimes differences. Usually, the differences are minor. For example, when talking about an attack, the text in English might just say that it took place “in the West Bank.” For a reporter in Europe, that will probably suffice. But for a local reporter, the West Bank is a big place and they will often share the specific location of the attack. I asked if the message about this home demolition video was different in Hebrew than it was in English. The message had only gone out in Hebrew. “They’re definitely aware of [the interests] of the international media versus the local media,” Gross explained. Home demolitions are well-regarded at home, not so much abroad. So they text out the video in Hebrew, not in English. 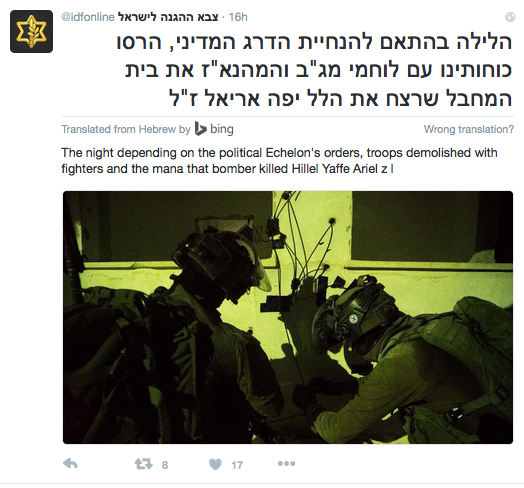 On the IDF’s Hebrew language Twitter account, they shared a screenshot of the video. On their English account, they made no mention of the incident. They also did the same thing on Instagram, sharing a shot of the home demolition video on their Hebrew language account, but not on their English language account. 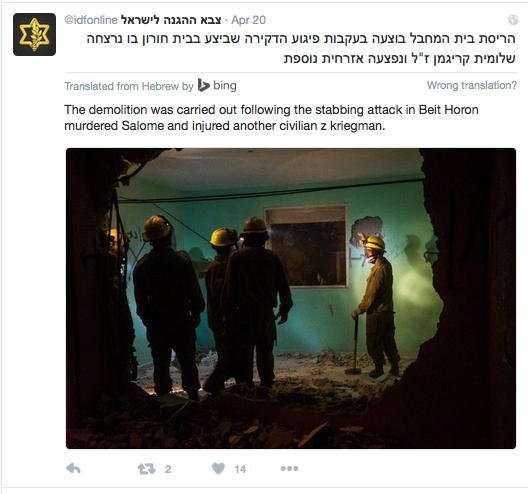 The IDF is showing a pattern of producing home demolition videos and sharing them with the Hebrew-speaking press and promoting the events on their Hebrew-language social media channels. They make no mention whatsoever of such incidents, on their own English language YouTube channel or blog, or through their English-language Facebook, Twitter, Instagram or Snapchat accounts. At least as far as the distribution of home demolition videos goes, this subtle difference certainly seems to hold true.